We are an RSA approved CVRT test operator for light commercials up to 3500 kg and heavy goods vehicles. Must take a commercial vehicle test every year to renew their commercial vehicle certificate of roadworthiness. Vehicles that fail the test must repair their failure items before they can be re-tested, many of these repairs can be carried out at Galway Truck Centre. Are required to take a commercial vehicle test every year to renew their commercial vehicle certificate of roadworthiness. Vehicles that fail must have failure items repaired before they can be re-tested, many of these repairs can be carried out at Galway Truck Centre. 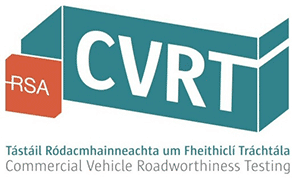 Only when you pass your CVR test, will you get your Certificate of Road Worthiness (CRW)? And you can't renew your tax without your CRW. You need to include your CRW in your motor tax application.